This article is about the hospital in New York City. For other uses, see Mount Sinai Hospital (disambiguation). Mount Sinai Hospital, founded in 1852, is one of the oldest and largest teaching hospitals in the United States. It is located on the Upper East Side in the New York City borough of Manhattan, on the eastern border of Central Park stretching along Fifth Avenue, between East 98th Street and East 103rd Street. The entire Mount Sinai health system has over 7,400 physicians, as well as 3,815 beds, and delivers over 16,000 babies a year. In 2018–19, the hospital was ranked 18th among the nearly 5,000 hospitals in the US by the U.S. News & World Report. At the time of the founding of the hospital in 1852, other hospitals in New York City discriminated against Jews both by not hiring them, and by prohibiting them from being treated in the hospitals' wards. Philanthropist Sampson Simson (1780–1857) founded the hospital to address the needs of New York City's rapidly growing Jewish immigrant community. It was the second Jewish hospital in the United States, after the Jewish Hospital, located in Cincinnati, Ohio, which was established in 1847. The Jews' Hospital in the City of New York, as it was then initially called, was built on West 28th Street in Manhattan, between Seventh and Eighth Avenues, on land donated by Simson. It opened two years before Simson's death. Four years later, it was unexpectedly filled to capacity with soldiers injured in the American Civil War. The Jews' Hospital felt the effects of the escalating Civil War in other ways, as staff doctors and board members were called into service. Dr. Israel Moses served four years as lieutenant colonel in the 72nd New York Infantry Regiment; Joseph Seligman had to resign as a member of the board of directors, as he was increasingly called upon by President Lincoln for advice on the country's growing financial crisis. The New York Draft Riots of 1863 again strained the resources of the new hospital, as draft inequities and a shortage of qualified men increased racial tensions in New York City. As the Jews' Hospital struggled to tend to the many wounded, outside its walls over 100 men, and children were killed in the riots. More and more, the Jews' Hospital was finding itself an integral part of the general community. In 1866, to reflect this new-found role, it changed its name. In 1872, the hospital moved uptown to the east side of Lexington Avenue, between East 66th and East 67th Streets. 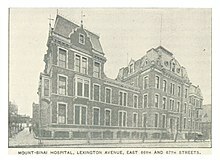 Now called Mount Sinai Hospital, the institution forged relationships with many physicians who made contributions to medicine, including Henry N. Heineman, Frederick S. Mandelbaum, Bernard Sachs, Charles A. Elsberg, Emanuel Libman, and, most significantly, Abraham Jacobi, known as the father of American pediatrics and a champion of construction at the hospital's new site on Manhattan's Upper East Side in 1904. The hospital established a school of nursing in 1881. Created by Alma deLeon Hendricks and a small group of women, Mount Sinai Hospital Training School for Nurses was taken over by the hospital in 1895. In 1923, its name was changed to Mount Sinai Hospital School of Nursing. This school closed in 1971 after graduating 4,700 nurses—all women, except one man in the last class. An active alumnae association continues. The early 20th century saw the population of New York City explode. That, coupled with many new discoveries at Mount Sinai (including significant advances in blood transfusions and the first endotracheal anesthesia apparatus), meant that Mount Sinai's pool of doctors and experts was in increasing demand. A $1.35 million ($37,600,000 in current dollar terms) expansion of the 1904 hospital site raced to keep pace with demand. The opening of the new buildings was delayed by the advent of World War I. Mount Sinai responded to a request from the United States Army Medical Corps with the creation of Base Hospital No.3. This unit went to France in early 1918, and treated 9,127 patients with 172 deaths: 54 surgical and 118 medical, the latter due mainly to influenza and pneumonia. Two decades later, with tensions in Europe escalating, a committee dedicated to finding placements for doctors fleeing Nazi Germany was founded in 1933. With the help of the National Committee for the Resettlement of Foreign Physicians, Mount Sinai Hospital became a new home for a large number of émigrés. When World War II broke out, Mount Sinai was the first hospital to throw open its doors to Red Cross nurses' aides; the hospital trained many in its effort to reduce the nursing shortage in the States. Meanwhile, the president of the medical board, George Baehr, M.D., was called by President Roosevelt to serve as the nation's Chief Medical Director of the Office of Civilian Defense. These wartime roles were eclipsed, however, when the men and women of Mount Sinai's 3rd General Hospital set sail for Casablanca, Morocco, eventually setting up a 1,000-bed hospital in war-torn Tunisia. Before moving to tend to the needs of soldiers in Italy and France, the 3rd General Hospital had treated more than 5,000 wounded soldiers. The Icahn Medical Institute at 1425 Madison Avenue was built in 1997. In 1963, the hospital created a medical school, and in 1968 it welcomed the first students of the Mount Sinai School of Medicine, now the Icahn School of Medicine at Mount Sinai. The 1980s had a $500 million hospital expansion, including the construction of the Guggenheim Pavilion, the first medical facility designed by I.M. Pei. Its faculty has made significant contributions to gene therapy, cardiology, immunotherapy, organ transplants, cancer treatments, and minimally invasive surgery. 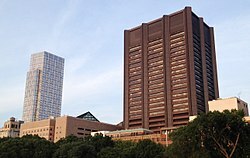 Among the innovations at Mount Sinai were performing the first blood transplant into the vein of a fetus in 1986, and the development of a technique for inserting radioactive seeds into the prostate to treat cancer in 1995. At Mount Sinai the staff performed the first successful composite tracheal transplant, which was performed at the hospital in 2005. Writing for The Boston Globe on 14 October 2007, Scott Allen reported the issue of patient abuse and problems with human resources management at Mount Sinai by Dr. Jack M. Gorman who was Department Chairman of Psychiatry at Mount Sinai. Allen stated that; "... officials at McLean learned that Gorman had, like so many patients at the renowned psychiatric hospital, attempted suicide. But their initial sympathy for a sick man turned to horror when they learned, from a legal document delivered in mid-May, why he had taken such a desperate measure. The married father of two had brought a shameful secret with him to Massachusetts: He had engaged in a long-term sexual relationship with a New York patient... Gorman, 55, inspired great hope when McLean and Partners announced that they had lured him away from New York City's Mount Sinai School of Medicine in October 2005... It was Gorman's decision to contact the New York Board of Professional Medical Conduct that finally brought the episode to public attention. Earlier this month, the board finally acted on what Gorman told them, posting on its website that his medical license had been indefinitely suspended for 'inappropriate sexual contact' with a patient." The issue of human resources management between nurses and doctors at Mount Sinai hospital was reported by Jose Martinez on April 20, 2010 in the New York Daily News. As stated by Martinez: "A Catholic nurse was forced to assist in an abortion at Mount Sinai Medical Center over her strenuous objections, a lawsuit filed Friday charges. Catherina Cenzon-DeCarlo, who works in the operating room at the Manhattan hospital, contends that her boss ordered her to assist in the May 2009 abortion of a 22-week-old fetus or face charges of 'insubordination and patient abandonment.'" In January 2013 David L. Reich was the first openly gay medical doctor named Interim President of Mount Sinai Hospital as reported by The New York Times; in October of the same year he was named president. James McKinley writing for The New York Times reported abuse issue investigations dealing with human resources management at Mount Sinai Hospital on March 24, 2016 when a doctor was brought to court for abuse of several patients. As stated by McKinley: "A former doctor at Mount Sinai Hospital in Manhattan was arraigned on Thursday on charges of sexually abusing four women who came into the emergency room there, touching their breasts for no medical reason and, in one case, drugging, groping and masturbating on a patient. The physician, Dr. David H. Newman, pleaded not guilty before Justice Michael J. Obus in State Supreme Court in Manhattan to one count of first-degree sexual abuse and four counts of third-degree sexual abuse. He remains free on bail. 'Four young women who came to the hospital for medical treatment were sexually abused by the very doctor entrusted with their care,' the Manhattan district attorney, Cyrus R. Vance Jr., said in a statement." In August 2016 Dennis S. Charney, the Dean of the medical school, was shot and wounded as he left a deli in his home town of Chappaqua, New York. Hengjun Chao, a former Mount Sinai medical researcher who had been fired by Charney for research misconduct in 2010, was convicted of attempted second degree murder and two other charges in 2017, and received a sentence of 28 years. On March 16, 2018 Brendan Pierson writing for Reuters and Katie Thomas writing for The New York Times reported that several doctors from Mount Sinai Hospital were charged in Federal Court for participating in a Fentanyl prescription kickback and bribery case stating: "The five doctors were arrested on Friday morning and face charges including that they violated the federal anti-kickback law and conspired to commit fraud. They pleaded not guilty on Friday before U.S. Magistrate Judge Sarah Netburn in Manhattan and were released on bail." The doctors were identified as Gordon Freedman of the Department of Anestesiology, Dialecti Voudouris of the Department of Oncology, and Alexandru Burducea of the Department of Anesthesiology. As of 2019, the entire Mount Sinai Health System had over 7,400 physicians, 2,000 residents and clinical fellows, and 42,000 employees, as well as 3,815 beds and 152 operating rooms, and delivered over 16,000 babies a year. 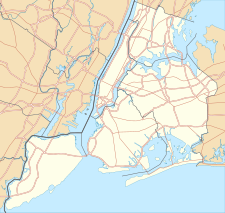 Mount Sinai has a number of hospital affiliates in the New York metropolitan area, including Brooklyn Hospital Center and an additional campus, Mount Sinai Hospital of Queens. The hospital is also affiliated with the Icahn School of Medicine at Mount Sinai, which opened in September 1968. In 2013, Mount Sinai Hospital joined with Continuum Health Partners in the creation of the Mount Sinai Health System. The system encompasses the Icahn School of Medicine at Mount Sinai and seven hospital campuses in the New York metropolitan area, as well as a large, regional ambulatory footprint. In 2018–19, Mount Sinai Hospital was recognized on the U.S. News & World Report "Best Hospitals Honor Roll," ranking 18th among the nearly 5,000 hospitals in the US, with 11 nationally ranked adult specialties (including cardiology & heart surgery (#10), diabetes & endocrinology (#36), ear, nose, and throat (#37), gastroenterology & GI surgery (#9), geriatrics (#3), gynecology (#24), nephrology (#14), and neurology & neurosurgery (#17)). It was ranked the #3 hospital in New York. Previously, Mount Sinai Hospital was ranked 16th on the U.S. News & World Report 2014-15 "Best Hospitals Honor Roll", and 15th on the 2016-17 "Best Hospitals Honor Roll." Leon Black donated $10 million in 2005 to create the Black Family Stem Cell Institute. Emily and Len Blavatnik made a $10 million gift in 2018 to establish The Blavatnik Family Women’s Health Research Institute at the Icahn School of Medicine at Mount Sinai and The Blavatnik Family – Chelsea Medical Center at Mount Sinai. Carl Icahn donated $25 million to Mount Sinai Medical Center for advanced medical research in 2004; a large building primarily devoted to research was renamed from the "East Building" to the "Icahn Medical Institute." In 2012, Icahn pledged $200 million to the institution. In exchange, the medical school was renamed the Icahn School of Medicine at Mount Sinai and the genomics institute led by Eric Schadt was renamed the Icahn Institute for Genomics and Multiscale Biology. Frederick Klingenstein, former CEO of Wertheim & Co., and wife Sharon Klingenstein donated $75 million in 1999 to the medical school, the largest single gift in the history of Mount Sinai medical school at the time, to establish an institute for scientific research and create a scholarship fund. Henry Kravis and wife Marie-Josée Kravis donated $15 million to establish the "Center for Cardiovascular Health" as well as funding a professorship. Samuel A. Lewis, NYC political leader and philanthropist who served for 21 years (1852–1873) as the first Director, then Honorary Secretary, and finally Chairman of the Executive Committee. Hermann Merkin gave $2 million in dedication of the kosher kitchen at the hospital. Derald Ruttenberg donated $7 million in 1986 to establish the Ruttenberg Cancer Center at Mount Sinai and later contributed $8 million more. Martha Stewart donated $5 million in 2007 to start the Martha Stewart Center for Living at Mount Sinai Hospital. The center promotes access to medical care and offers support to caregivers needing referrals or education. James Tisch and wife Merryl Tisch donated $40 million in 2008 to establish The Tisch Cancer Institute, a state-of-the-art, patient-oriented comprehensive cancer care and research facility. Burrill Bernard Crohn (1884–1983), gastroenterologist and one of the first to describe the disease of which he is the namesake, Crohn's disease. Sander S. Florman, Director of Recanati/Miller Transplant Institute. Abraham Jacobi (1830–1919), pediatrician and president of the American Medical Association. Pioneer of pediatrics In the US, devoted to women's and children's welfare. David L. Reich, academic anesthesiologist, President and Chief Operating Officer of Mount Sinai, Chair of the Department of Anesthesiology, Horace W. Goldsmith Professor of Anesthesiology. Milton Sapirstein (1914–1996), clinical psychiatrist. Sought "to mesh the advances being made in neurobiology in the 1940's with psychoanalytic concepts." ^ a b "About The Mount Sinai Hospital". Icahn School of Medicine at Mount Sinai. Retrieved April 14, 2017. ^ "When the Jews congregated at Mount Sinai," The Jerusalem Post. ^ This House of Noble Deeds, Mount Sinai Hospital, 1852 – 2002, Arthur H. Aufses, Jr. and Barbara J. Niss, New York University Press. ^ "Mount Sinai: Mount Sinai Hospital: History"
^ "New York Draft Riots"
^ "Mount Sinai Hospital – Inauguration of the New Buildings – Gov. Hoffman's Address – Description of the Edifice". The New York Times. May 30, 1872. p. 2. Retrieved May 25, 2016. ^ FAQs.org – "Abraham Jacobi Biography"
^ American Journal of Public Health, June 1943. ^ "Veterans' History Project: Interview with Isabelle Cook"
^ a b "Mount Sinai Hospital"
^ The New York Times, November 24, 2002. ^ "David L. Reich, MD, Named President of The Mount Sinai Hospital". Retrieved May 20, 2014. ^ Bromwich, Jonah Engel (August 29, 2016). "Fired Professor Shot 2 Men Outside Chappaqua Deli, Police Say". The New York Times. ^ Guarino, Ben (August 31, 2016). "After losing suit against former boss at top med school, a scientist shoots him, police say". Washington Post. ^ "Ex-researcher who shot dean found guilty of attempted murder". Retraction Watch. June 14, 2017. ^ "Man Sentenced In Shooting Of Mount Sinai Medical School Dean," CBS New York. ^ US Department of Justice. Case filing for March 16, 2018. Southern District of New York. .
^ Mount Sinai School of Medicine: History retrieved on April 28, 2010. ^ "U.S. News & World Report: 2014-15 Best Hospitals Rankings"
^ "U.S. News & World Report: 2016-17 Best Hospitals Rankings"
^ "Mount Sinai School of Medicine establishes Stem Cell Institute"
^ "Financier Gives $25 Million to Mount Sinai Medical Center"
^ New York Times: "Mount Sinai Gets $25 Million Gift"
^ Nussbaum, Alex (November 15, 2012). "Carl Icahn to Give $200 Million to Mount Sinai School". Bloomberg. Retrieved April 22, 2013. ^ New York Times: "Financier Gives $75 Million To Mt. Sinai Medical School"
^ New York Times: "Derald H. Ruttenberg, 88, Quiet Deal Maker, Dies"
^ USA TODAY: "Senate panel calls on Martha Stewart"
^ Waggoner, Walter H. (July 30, 1983). "Dr. Burrill B. Crohn, 99, An Expert on Diseases of the Intestinal Tract". The New York Times. Retrieved May 25, 2016. ^ "Sander Florman | Mount Sinai – New York". Mount Sinai Health System. Retrieved July 24, 2016. ^ Saxon, Wolfgang (December 5, 1996). "Milton Sapirstein, 81, Professor And Researcher in Psychiatry". The New York Times. 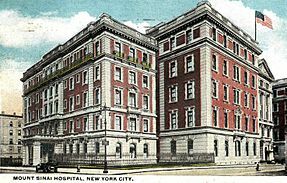 Wikimedia Commons has media related to Mount Sinai Hospital (Manhattan).